If your doctor has recommended you have a diagnostic imaging test such as an X-ray, MRI, CT scan, ultrasound, or mammogram, a Florida Diagnostic Imaging center is your first choice for accuracy, dependability, ease and convenience. Not all imaging services are available at each location. To determine if a specific imaging procedure or study is available at the location of your choice, please visit the corresponding service or location page. Your doctor may advise where you have the test, but the decision is yours. You can take your radiology order to any facility that offers the test. Hospital-owned facilities typically charge more than independent outpatient facilities. Ask your doctor for facility choices. Your doctor's office might schedule the test for you, but once you have the signed order you can schedule or re-schedule the test at the facility you choose. 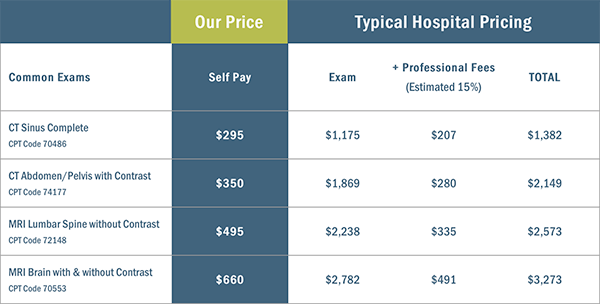 Not all imaging facilities are the same; cost can vary greatly, even for patients with insurance. Ask questions; be informed. Stop in at any of our statewide center locations to schedule with our front desk.